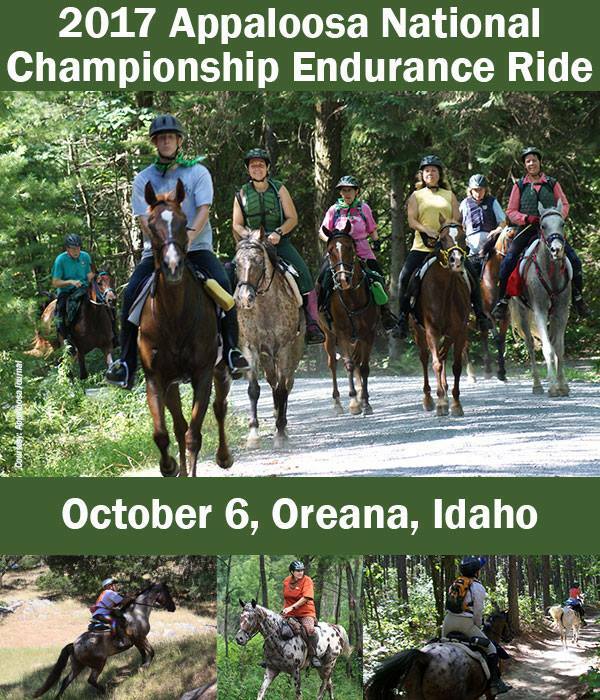 2017 Appaloosa National Championship Endurance Ride, Oreana, Idaho, October 7. The 2017 Appaloosa National Championship Endurance Ride (ANCER) will be held in conjunction with the Arabian Horse Association Distance Nationals in Oreana, Idaho on October 7, 2017. The ride is called "Owyhee Canyonlands Pioneer" and is an AERC-sanctioned 50-mile ride. ANCER has been held in locations across the country from Maine to California. It is rotating to the Western U.S. this year. The Arabian Horse Association and Appaloosa Horse Club are partnering for the second year to hold a multi-breed National Endurance Championship ride. Registered Appaloosas that are also registered with AHA as ½ Arabian may enter both National Championships. Go to http://www.appaloosa.com/trail/national-champ.htm to download forms. The ANCER will be held in conjunction with the Arabian Distance Horse National Championships.